A knife is a sharp-edged hand tool used for cutting. A minimal knife is a blade and some method of gripping it. Knives have been used as tools and weapons since the Stone Age. The first known knives were flint or other rock, chipped or ground to an edge, sometimes with a handle. Palaeolithic knives may also have been made from wood, bone or antler, but these materials do not survive in the archaeological record. Advances in smelting and metallurgy have led to blades made of bronze, iron, then steel and more exotic materials. Both materials and designs have changed over time. Germany is well known for it's durable, extremely sharp knives mainly produced in the town of Solingen. All cultures use knives as tools. Together with the fork and spoon, the knife has been a ubiquitous eating and cooking utensil in the Western world since at least the Middle Ages. The importance of knives as weapons has declined, but knives are still made and carried for other purposes. The tang is an extension of the blade into the handle. The bolster usually helps to join the blade to the handle and adds greater strength. Some bolsters also may function as a barrier, or handguard, to prevent fingers from slipping onto the blade. A bolster with a definite extension away from the handle often serves as a guard to further protect the hand when using a knife. Common blade features include serrations, coatings, and functional or decorative embellishments, including engraving, opening holes, thumb studs, disks and nail grooves. A fuller, sometimes mistakenly called a blood gutter or blood groove, is a depression along a blade. There is a myth that this promotes bleeding from stabbing wounds. The actual function is to lighten the blade without sacrificing stiffness, and on many knives it is purely decorative. Some knives have a choil where the blade is unsharpened and possibly indented as it meets the handle. A small choil is used to prevent scratches to the handle when sharpening the blade, while a large choil is useful as a forward-finger grip. Handles may be made of any solid material: wood, steel and decorative materials are common. A hole in the end of the handle allows the knife to be hung or placed on a lanyard. Knives are divided into folding knives and fixed blade knives. A folding knife stores the blade within the handle, whereas a fixed blade needs a sheath or other storage method when not in use. The handle of a folding knife is built around the frame; on the inside may be liners, and on the outside there may be slabs. Folding knives can include a locking mechanism; there are many types, but the three most common locks are lock backs, Walker linerlock, and frame locks. Fixed blade knives may have single or multipart handles, usually attached to the blade's tang. A full-tang design extends the tang all the way through the handle; these can be the strongest fixed blades. Activities that require a strong blade, such as hunting or fighting, typically rely on a fixed blade. Some famous fixed blade designs include the Ka-bar and Bowie knives. There are thousands of commercial manufacturers including Cold Steel, Dexter-Russell, Forschner/Victorinox, Wüsthof, Global, Henckels, Kershaw Knives, SpyderCo, Benchmade, Strider Knives, Emerson Knives, Microtech, Böker (Tree Brand), and Buck. There are also hundreds of small knifemaking shops, usually specializing in a few kinds of knives or custom work. Knifemaking is also a popular hobby, and may consist of handlemaking, blade forging, or both. Knife blades are sometimes typically made of steel (metal), but obsidian, glass, titanium, ceramic and plastics are also used. Two recently introduced materials are Stellite and Talonite. There are a large number of alloys used as knife steels, mostly variants of high-carbon and stainless steels. Most knife steel is tempered martensite, which has a fine-grained crystal structure with lattice irregularities that make it hard. It is formed by quenching, changing it from the austenitic structure of a high temperature to a harder structure. The blade is then tempered by heating to an intermediate temperature for a period to reduce brittleness. A knife steel usually has fairly low nickel content, because nickel tends to keep steel in the austenitic structure even when cold. Steels having high carbon but low chromium content ("carbon steel") are prone to rust and pitting if not kept dry and oiled. Stainless steel knives began gaining popularity during the second quarter of the twentieth century. Stainless steel is steel with very high (12–18%) alloy content, usually chromium — stainless knife steels may be high in carbon, but "carbon steel" means there are few or no additional alloying ingredients. Stainless steel is relatively resistant to corrosion (though knife steel is less so than higher nickel stainless steel) because, except in acid, one of the metals or one of the oxides is always stable. The alloy disruptions to the crystal lattice explain the reputation of stainless steels for long wear (the carbides are harder than the metal) and for being harder to sharpen than rust prone, low alloy ("carbon") steel. Harder steels can take sharper edges. The bulk hardness and toughness of stainless steel tend to be lower than those of low alloy steel. Common stainless knife steels include 154CM and ATS-34, 420M, AUS8 and AUS10, 440A and 440C, VG10, S30V, CPM440V and others. Common high-hardness knife steels (tool steel) include D2 and M2. Knifemakers sometimes use titanium, cobalt, and other alloys. These are more ductile than typical stainless steels, but have vocal supporters despite concerns about health effects of cobalt content. Damascus steel is made by a set of techniques for mixing several steels. The cost of the process restricts it to high-end knives. There is typically more demand for exotic alloys in the utility, outdoor, and tactical or combat knife categories than there is for kitchen knives. Vanadium and molybdenum are important alloy metals because they make the grain size smaller, which improves hardness and toughness. Vanadium and molybdenum may increase corrosion resistance, although work by CATRA (Cutlery Allied Trades Research Association) has found no anti-corrosive benefits from vanadium. Chromium is the major anticorrosive component in most knife materials. Some manufacturers, particularly of kitchen knives, make ceramic blades; the Ceramic knife blade is harder and stay sharp longer than steel, but because of their brittleness chip and break more readily. Blade styles with typical edges highlighted. (1) A normal blade has a curving edge, and flat back. A dull back lets the wielder use fingers to concentrate force; it also makes the knife heavy and strong for its size. The curve concentrates force on a small point, making cutting easier. This knife can chop as well as pick and slice. (2) A curved, trailing-point knife has a back edge that curves upward. This lets a lightweight knife have a larger curve on its edge. Such a knife is optimized for slicing or slashing. (3) A clip-point blade is like a normal blade with the back "clipped" or concavely formed to make the tip thinner and sharper. The back edge of the clip may have a false edge that could be sharpened to make a second edge. The sharp tip is useful as a pick, or for cutting in tight places. If the false edge is sharpened it increases the knife's effectiveness in piercing. The Bowie knife has a clipped blade and clip-points are quite common on pocket knives and other folding knives. (4) A drop-point blade has a convex curve of the back towards the point. It handles much like the clip-point through with a stronger point less suitable for piercing. Swiss army pocket knives often have drop-points on their larger blades. (5) A spear-point blade is a symmetrical blade with a spine that runs along the middle of the blade. The point is in line with the spine. Spear-points may be single-edged (with a false edge) or double-edged or may have only a portion of the second edge sharpened. Pen-knives are often single-edged spear-points, usually quite small, named for their past use in sharpening quills for writing. Pen-knife may also nowadays refer to somewhat larger pockets knives which are often drop-points. Some throwing knives may have spear-points but without the spine, being only flat pieces of metal. 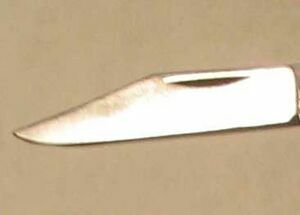 (6) A needle-point blade is a symmetrical, highly tapered, twin-edged blade often seen in fighting knives, such as the Sykes-Fairbairn commando knife. Its long, narrow point offers good penetration but is liable to breakage if abused. (7) A spay-point (once used for spaying animals) has a single, mostly straight edge that curves strongly upwards at the end to meet a short, dull, straight clip from the dull back. With the curved end of the blade being closer to perpendicular to the blade's axis than other knives and lacking a point, making penetration unlikely, spay points can be suitable for skinning. 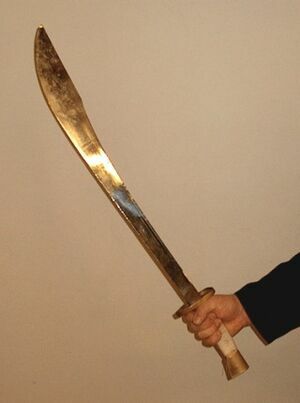 (8) A Westernised tanto style knife has a somewhat chisel-like point that is thick towards the point (being close to the spine) and is thus quite strong. It is superficially similar to the points on most Japanese long and short swords (katana and wakizashi). The traditional Japanese tanto knife uses the blade geometry of (1). The Westernised tanto is often straight but may also be gently curved. The point is actually a second edge on the end of the blade, with a total edge angle of 60 – 80 degrees. Some varieties may have the back edge angled to the point slightly and sharpened for a short distance from the point. (9) A sheepsfoot knife has a straight edge and a straight dull back that curves towards the edge at the end. It gives the most control, because the dull back edge is made to be held by fingers. Sheepsfoot knives are good for whittling and trimming sheep's hooves. (11) An ulu (Inuit woman's knife) knife is a sharpened half-circle. This blade type has no point, and has a handle in the middle. It is good for scraping, and sometimes chopping. It is the strongest knife shape. An example is a head knife, used in leatherworking both to scrape down leather (reducing thickness), and to make precise, rolling cuts to form shapes. Most folding knives have a locking mechanism. The most traditional and commonplace lock is the slip-joint. This is not really a lock at all, and is found most commonly on traditional pocket knives. It consists of a backspring that wedges itself into a notch on the tang on the back of the blade. The lockback is the simplest and most common true locking knife. It is like a slip-joint, but the lock includes a pivoted latch connected to a spring. To disengage, one presses the latch on the spine of the knife down, releasing the tang. The Walker linerlock, or linerlock is also common today. Its main advantage is that it allows the lock to be disengaged with one hand. When the blade opens, a bent liner presses against the rear of the tang, preventing it from swinging back. To disengage, the liner is pulled back to the side of the knife. The framelock is a variant of the liner lock in which the frame functions as the spring. It is often more secure than a liner lock because it does not require as close a tolerance in manufacture. There are many other modern locks with various degrees of effectiveness. Most of these are particular to single brands, notably Benchmade's AXIS™ lock and SpyderCo's Compression™ lock. Many folding knives (particularly locking models) have a small knob, disk or hole that allows the user to open the knife quickly with one hand. Another approach is the Carson flipper, a bump protruding from the blade's choil that may be pushed down when the blade is closed. In general, knives are either working knives (everyday-use blades), or fighting knives. Some knives, such as the Scottish dirk and Japanese Tantō function in both roles. Many knives are specific to a particular activity or occupation. Old carving knife and carving forks, non-stainless steel. Stag handles. A bread knife is a knife with a long serrated blade especially designed for easily cutting all types of bread. The blade is straight with a blunt end. The serrations (teeth) allow it to cut bread using less vertical force, preventing the bread from being compressed. This may leave fewer crumbs than other knives. A boning knife is used for removing bones from meat, poultry, and fish. A carving knife is for carving large pieces of meat such as large birds and roasts at the dining room table. Its appearance is, therefore, more emphasized than that of a kitchen knife. A table knife is part of a table setting, along with spoons and forks. It can be a butter knife, more literally a small spatula, not intended to cut at all, or a steak knife, or it may serve both functions. A palette knife is used by artists for tasks such as mixing and applying paint, and in cooking for spreading icing (in the U.S. this knife is referred to as a frosting spatula). Some palette knives have a serrated edge on one side. For whittling (artistic wood carving) a blade as short as 25mm (1 inch) is common. A utility knife is used for cutting sheet materials, including cardboard boxes. An electrician's knife is used to cut the insulatory sheath off electrical wire and to cut wire that is folded over the blade. For this purpose it is specially insulated to decrease shock hazards. A scalpel is a medical knife, used to perform surgery. Custom-made knives called microtomes are used to cut specimens for microscopy. The sharpest knives ever constructed are probably the ultramicrotomes with diamond edges used to slice samples for electron microscopes. Microtomes and scalpels are not customarily sharpened, but discarded after use. A hunting knife (or "Coutre Chasse") is used to dress large game. Its blade often has a normal, mild curve or is curved and clipped. Some hunting knives, called skinners, have a "gut hook" blade. This is a section on the top point of the knife which is specifically designed to cut the abdominal skin of killed game without disturbing the internal organs. A stockman's knife is a versatile folding knife with three blades: a clip, a spey (blunted point, straight edge), and possibly a sheepsfoot or pen blade. It is one of the most popular folding knives ever made. A dive knife, diver's knife, or river knife is adapted for use in diving and watersports. These knives are usually fixed blade, use high chrome stainless steel or titanium for corrosion resistance, have tough synthetic handles, and durable, quick-release sheaths that can be affixed to a PFD or dive vest. Blunt blade tips are common, and reduce the chance of injury if cutting a strap or line wrapped around a person. Line-cutting hooks are useful for cutting fine fishing lines that may tangle a diver, and serrated blades are often used to provide maximum cutting ability for tough synthetic lines and fabrics. Corrosion resistance is especially important if the knife is to be used in saltwater environments. Diving knives are often specialty items, made by small niche makers, though some major brands, such as Gerber Legendary Blades and Kershaw Knives, offer such knives. Utility or multi-tool knives may contain several blades, as well as other tools such as pliers. Examples include Leatherman, SOG, Gerber, Wenger and Victorinox (The "Swiss Army knife") tools. A kukri is a Nepalese fighting and utility knife with a deep forward curve. A machete is a long, wide blade, used to chop through brush. This tool (larger than most knives, smaller than a sword) depends more on weight than a sharp edge for cutting power. A parang, bolo, or golok is a knife very similar to a machete but heavier and with a blade designed to move the center of gravity further from the hand for increased chopping power in woodier vegetation. A survival knife is a sturdy knife, sometimes with a hollow handle filled with survival equipment. The strongest hollow-handled knives have both blade and handle formed from a single piece of steel. The screw-on cap on the handle usually has an O-ring seal to keep water out. The pommel may be strengthened for pounding or chipping. Equipment that may be found in the handle includes a compass (usually in the pommel), monofilament line for snares and fishing, black nylon thread and needles, plastic ties, barbed and unbarbed fishhooks (unbarbed doubles as a suture needle), bandages, water purification tablets, and waterproof matches. Knives are sharpened by grinding against a hard rough surface, typically stone, or a soft surface with hard particles, such as sandpaper. For finer sharpening, a leather razor strap, or strop, is often used. The smaller the angle between the blade and stone, the sharper the knife will be, but the less side force is needed to bend the edge over or chip it off. Very sharp knives sharpen at 10 degrees. Typical knives are sharpened at 15 degrees. Knives that require a tough edge (such as those that chop) sharpen at 20 degrees or more. For an extremely durable edge (such as a chisel or drawknife), blades can be sharpened to 30 degrees. In general, the harder the material to be cut the higher the angle of the edge. The composition of the stone affects the sharpness of the blade (finer grain produces sharper blades), as does the composition of the blade (some metals take and keep an edge better than others). Clamp-style sharpening tools use a clamp with several holes with pre-defined angles. The stone is mounted on a rod and is pulled through these holes, so that the angle remains consistent. Another system is the crock stick setup, where two sticks are put into a plastic or wooden base to form a V shape. When the knife is pulled up the V, the angle is held so long as the blade is held perpendicular to the base. Honing stones (also called whetstones) come in coarse and fine grits and can be described as hard or soft based on whether the grit comes free of the stone with use. Arkansas is a traditional source for honing stones, which are traditionally used with water or honing oil. India is another traditional source for stones. Ceramic hones are also common, especially for fine grit size. Japanese water stones (both artificial and natural) come in very fine grits. They are stored in water, and develop a layer of slurry which dulls the edge if the blade is honed as if honing into the stone. Generally, these are more costly than oilstones. Coated hones, which have an abrasive, sometimes diamonds, on a base of plastic or metal, are also available. Sharpening blocks made with corundum are expensive. Another sharpening tool is known as a honing steel. A honing steel is a type of hardened cylindrical rod used similarly to honing stones. For example, a butcher steel is a round file with the teeth running the long way, while a packer steel (used in the meat packer's industry) is a smooth, polished steel rod designed for straightening the turned edge of a knife, and is also useful for burnishing a newly finished edge. 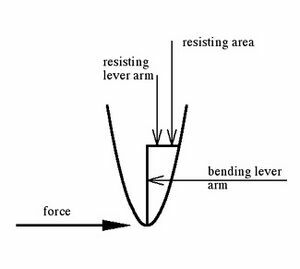 Because steels have a small diameter they exert high local pressure, and therefore affect the knife metal when used with very little force. They are intended for mild steel knives that are steeled several times a day, but are not well suited for today's tougher and harder steels. Stropping a knife is a finishing step. This is often done with a leather strap impregnated with abrasive compounds, but can be done on paper, cardstock, or even cloth in a pinch. It will not cut the edge significantly, but produces a very sharp edge with very little metal loss. It is useful when a knife is still sharp, but has lost that 'scary sharp' edge from use. Maintenance may be done with a steel. This process can affect alignment of the edge. Realigning the edge can keep a knife sharp as often a rolled edge is responsible for dullness. A very sharp knife has an edge that is too small to see with the eye; it may even be hard to focus in a microscope. The shape near the edge can be highlighted by rotating the knife and watching changes in reflection. Nicks and rolled edges can also be seen. If a knife is used as a scraper, a prybar, or encounters hard particles in softer materials or is used asymmetrically, there may be a sideways load at the tip. This may damage the knife. Carrying knives in public is forbidden by law in many countries. Exceptions may be made for hunting knives, and for knives used for work-related purposes (e.g. chef's knives). Automatic knives (switchblades) are often banned from civilian carry or possession. Butterfly knifes (Balisong) are also frequently restricted due to an impression of connection with gang activity. A notable exception is Austria, where civilian possession of automatic knives including double-edged automatic OTF ("out The front") daggers are allowed. Most Western European nations are very unfriendly toward all knives other than small pocket knives and similar small tools. Carrying knives on commercial airplanes is subject to many prohibitions which vary too frequently to be listed here. Knives can normally be transported by air travelers if securely packed in hold luggage, where they will be inaccessible during the flight. Knife laws vary tremendously from state to state, and even from city to city inside a state. In Texas, for example, individuals may carry knives openly or concealed so long as they are single-edged, and are not daggers, switchblades, or gravity knives (Butterfly knife legality is questionable — there have been convictions). In some other states, fixed-blade knives are banned, open carry is banned, and sometimes concealed carry of anything except pocket knives is banned. Cities have ordinances further restricting these laws; in San Antonio, TX, it is a violation to carry a folding knife having a locking blade. California allows switchblades with blades less than two inches long. In some metro areas such as Washington, D.C., going into office buildings or museums, or simply loitering while carrying even small 3" folding knives can be problematic. Other restricted areas in the U.S. include court buildings, federal property (which technically limits blades to 2.5-inches), and public school grounds. New designs such as Assisted Open knives make the question of what is legal to carry even more complicated. The Federal Switch Blade law prohibits possession of any knife designed to open with the use of a mechanical release. The Assisted Open design used, for example, by Kershaw employs a system by which the user starts the blade open by pressing a nub on the knife tang which extends out the back of the handle liners. The torsion bar then takes over and completes the opening of the knife. This system has been determined not to be a mechanical release since the user actually starts the blade with a push of their finger not a release or button being pressed. Knife possession is legislated differently in public places and in private. In private, a person can own any type of knife except automatic knives (flick knives, butterfly knives, and switchblades). In general, knives carried in public places are legally considered to be offensive weapons and the carrier can be charged with "possession of an offensive weapon". It is however legal to carry a knife if there is a bona fide reason to do so for example, if it is a tool required for ones trade (e.g. chefs) or if it is part of a national costume (e.g. sgian dubh), or if it is carried for religious reasons (e.g. Sikh Kirpan). A special exception exists for penknives (pocket knives) which are legal without reason for possession, but they must be non-locking and within 3 inches folded (7.62cm). Any other article with a blade or point is illegal to possess in a public place, except with a reasonable excuse.Even a folding pocket knife of less than 3" may still be considered an offensive weapon if carried or used for that purpose. Although English law insists that it is the responsibility of the prosecution to provide evidence proving a crime has been committed an individual must provide evidence to prove that they had a bona fide reason for carrying a knife (if this is the case). Whilst this may appear to be a reversal of the usual burden of proof, technically the prosecution has already proven the case (prima facie) by establishing that a knife was being carried in a public place. With the exception of any type of switchblade, any knife with an overall length of 15cm (about 5.9in), with a blade length of no more than 6cm, is legal to carry. Knives must be concealed and should not be easily available. The Japanese Guns and Knives Control Law forbids knives being used as defensive weapons, but is relatively tolerant toward knives which can be opened using a single hand. For example, any type of butterfly knife is legal. With the exception of Japanese Katana, any other swords are regarded as offensive weapons. However, if they have artistic value, possession is legal as long as the sword is registered. Violations of the law come with a sentence of up to 1 year in prison and a fine of ¥300,000 or about U.S. $2,700. German law explicitly forbids a few types of knives and regards other types of knives as weapons. All other knives can be owned and carried without infringing on the law. The law defines a weapon to be any item that is intended to reduce or eliminate the ability of a person to attack another person or to defend themselves. Example: A bayonet is intended to injure or kill people, hence it is regarded as a weapon by the law, while a machete is regarded as a tool to clear dense vegetation. A knife with a two-sided blade and a switchblade which is not illegal as described below is always regarded as a weapon. A Sabre and similar items are regarded as weapons. The law makes an exception for push daggers: These knives may be owned and used by owners of a hunting permit, or by members of the fur industry. All weapons are subject to restrictions, including a minimum age of the owner, they have to be stored properly and may not be carried on certain public events. All knives that are not illegal or regarded as weapons can be purchased, owned and carried by anyone. The handle can be altered in shape (for better grip) or material (to prevent electric shock or burns). The surface finish of the blade can be darkened or polished. ↑ by Razor Edge Systems, described in their book "The Razor Edge Book of Sharpening". Sharpening Made Easy - a 40 page website devoted to knife sharpening. Many sharpening systems reviewed. Book, instruction and equipment available. Great Sharpening Instructions - A Website that has excellent instructions on how to sharpen knives and what types of sharpeners are best. This page was last edited on 20 October 2016, at 23:59.